We have developed a state-of-the-art infrastructure at our premises, which is well-equipped with all the necessary machines and contemporary technologies. 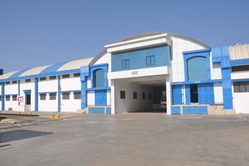 Our infrastructure sprawls over a large area and divided into various departments like processing unit, quality tests unit and warehouse & packaging wing. Our processing department has all the advanced facilities for meeting the bulk requirements of our clients'' within the stipulated time frame. This department is hygienically maintained by our professionals, and helps to efficiently formulate the products as per the individual demands of our clients. Moreover, our the processed products are safely stored and packaged in our warehousing & packaging department in order to preserve their natural properties. We are aware of the fact that the food products, such as Papads (Snack Pellets), are liked by all only if these remain crunchy and crispy till these are opened. Considering these, we have set up a separate packaging unit at our infrastructural base, wherein the range of Papads (SnackPellets), are packaged well using optimal quality material. These products are sealed in air tight packets, so that these do not catch moisture and lose their crispness. Further, we make sure that the material used for packaging has tear strength, so that the products reach the clients safely without any damage. In accordance with the requirements, we provide our clients customized packaging solutions as well, with respect to size and quantity.